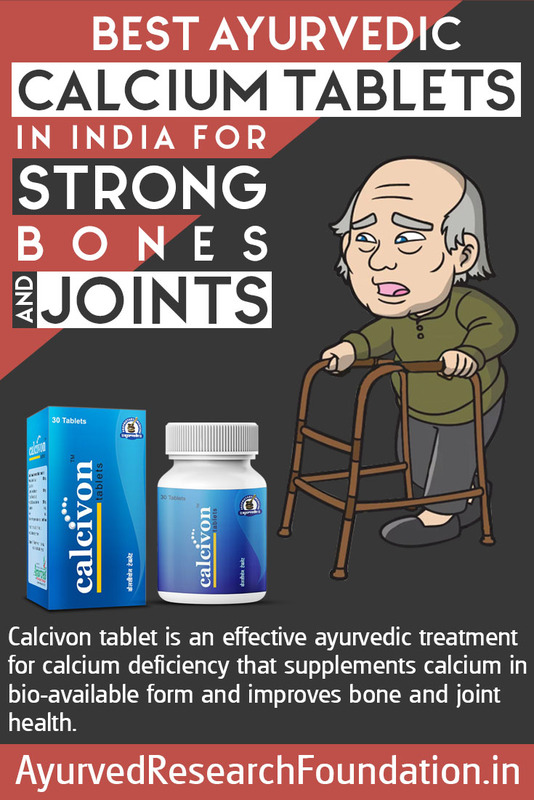 Calcivon tablet is an effective ayurvedic treatment for calcium deficiency that supplements calcium in bio-available form and improves bone and joint health. Calcium deficiency can be source of many disorders. Calcium is vital component for teeth, nails and hairs and it is also very crucial for muscular performance. The major role of calcium is in building bone tissues. Bones are not static organs, the tissues get worn out which are required to be replaced regularly by body to keep bones healthy, flexible and dense. When body suffers with calcium deficiency it is unable to keep hairs, teeth and nails strong and also suffers with muscular lethargy and weakness. Major disadvantage is that body starts stealing calcium from bones and makes them feeble, thin and rigid prone to suffer with fractures and cracks. 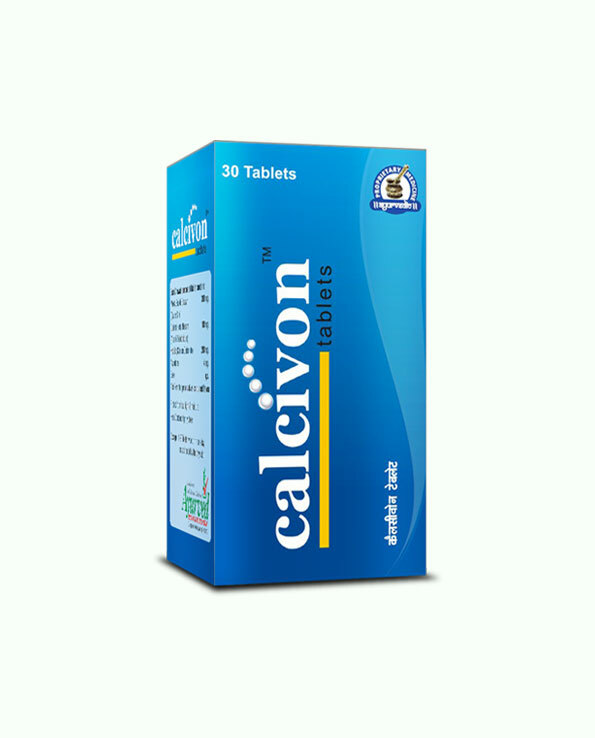 Calcivon tablets are ayurvedic treatment for calcium deficiency which alleviates all these conditions effectively. 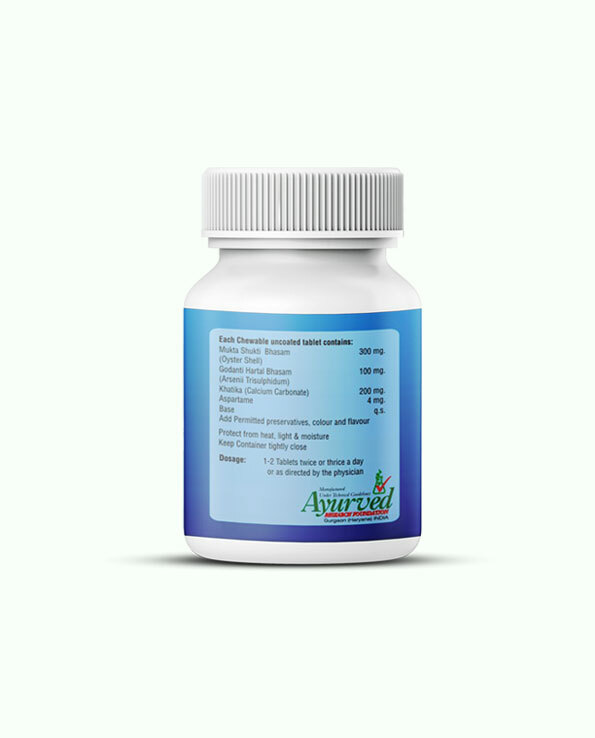 The herbs present in this ayurvedic treatment for calcium deficiency fulfill calcium requirements quickly and provide relief. 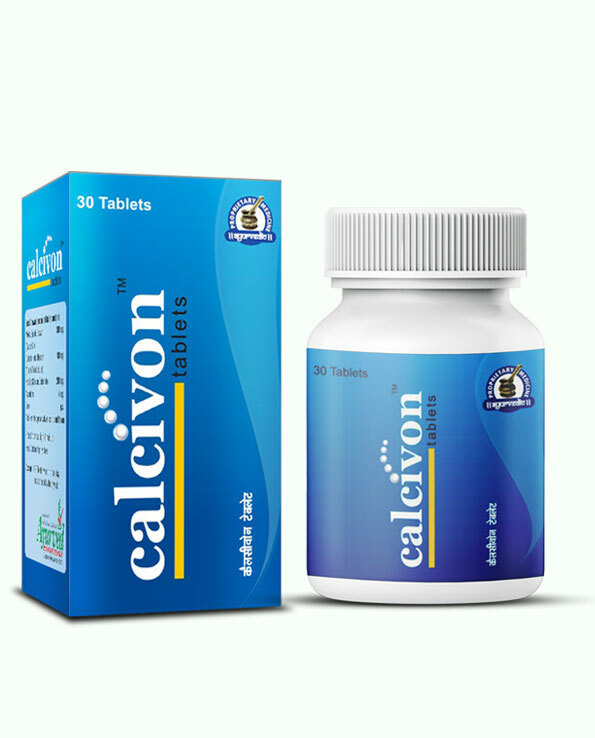 Poor calcium metabolism, diet lacking in this vital mineral and metabolic disorders are primarily responsible for calcium deficiency, ayurvedic treatment for calcium deficiency provided by Calcivon tablets handles the problem occurring due to any of these reasons. By supplementing calcium in bio-available form it provides fast and reliable ayurvedic treatment for calcium deficiency and also improve metabolism to gain calcium from diet efficiently. This herbal calcium supplement along with calcium also provides vitamin D which speeds-up process of bone tissue generation and work as powerful calcium supplements for bone and joint health. Weakness in bones causes weak and stiff joints too. Ayurvedic treatment for calcium deficiency by increasing bone tissue generation strengthens bones and joints both to provide fitter, stronger and agile body. Muscles need calcium to contract and relax, ayurvedic treatment for calcium deficiency improves muscular performance and endurance by providing calcium and cure problems like muscular lethargy and weaknesses. Calcivon tablets are calcium supplements for bone and joint health which also keep denture strong and prevent their shedding and breaking. These herbal calcium supplements promote stronger and healthier nails and hairs and improve looks of a person. Ayurvedic treatment for calcium deficiency provided by Calcivon tablets not only improves strength, stability and agility of physique and joints but also make a person look younger than his or her age. This ayurvedic treatment for calcium deficiency is very useful for women suffering with menopausal symptoms and also for those who suffer with brittle bones due to osteoporosis. Calcivon tablets also relieve and arrest progression of osteoarthritis in ageing individuals by keeping bones and joints healthy. Are these tablets safe to use? Yes, Calcivon tablets are perfectly safe for use by men and women of all ages. These contain herbs which supplement calcium and also promote its metabolism to prevent the problem from occurring in future. These supplements reverse damages caused by calcium deficiency and not only improve strength and vitality but also enhance looks of a person considerably. What are the ingredients of these tablets? 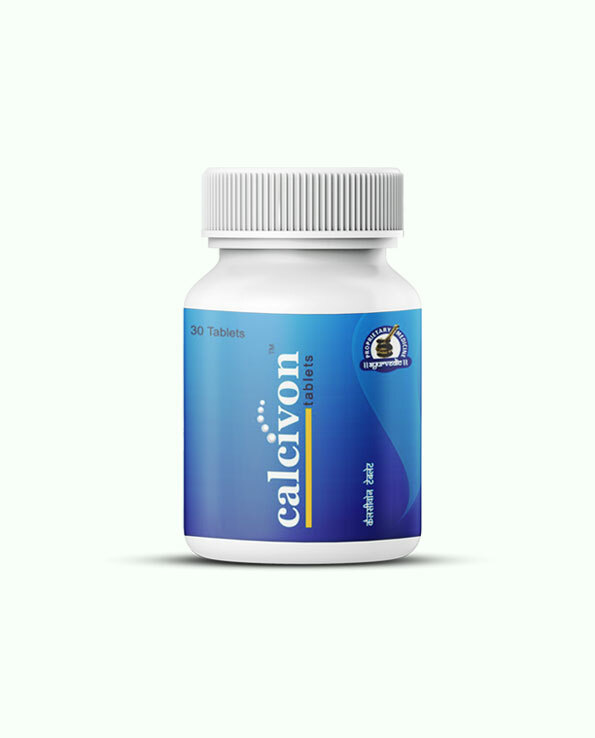 Calcivon tablets contain herbs which are rich sources of calcium and boost-up metabolism in body. The ingredient list of these tablets goes as – Guggul, Asthisanghar, Chobchini, Rasna extract, Ashwagandha, Suranjan and Godanti hadtal. All of these herbs collectively provide calcium and improve calcium metabolism. These curb osteoporosis, check arthritis, prevent bone atrophy and enhance musculoskeletal system and its endurance considerably. How to use these tablets? Herbal supplements are designed so that people can gain benefits of herbs without problems. Calcivon tablets are no different and are very easy to use. Consume one or two pills with water or milk after breakfast and dinner in a day. All you need to do is maintain regularity. How long do I need to take these tablets for complete relief? Herbs are not supposed to eradicate disorders overnight. These provide natural treatment and enhance body’s own mechanism to correct disorders which needs time. Generally people are recommended to use these pills for 4 months but in severe cases duration of 6 months is recommended. Fat-free dairy products are good sources of calcium which shall be regular part of diet, fruits and vegetables high on vitamin C is also necessary to metabolize calcium quickly. Spend some time out in the Sun for 20 minutes to gain vitamin D and include green vegetables, legumes and seeds in your diet as well. We offer facility of COD in India, along with COD you can also avail other methods of payments which are – cheque, DD or NEFT. You can also deposit cash in our account directly. How do you ship Calcivon? Within how many days will I receive these tablets? You will get your order in India within 3 to 5 working days. We ship our products through FedEx and ensure that your privacy is maintained at each step. You will get your order packed in a plain envelope which will hide the details of the product completely. My doctor recommended calcium supplement as I was having osteoporosis problem. It has all the ingredients that were recommended for bone health. I highly recommend this product. It is important to get a good supplement of calcium for your bones and overall health. I take these supplements for my bones and joints. And it really helped me in improving joint health. I got this product for my mother as she has calcium deficiency. After taking this supplement there is great improvement in calcium level. Highly recommend to those who are having the same problem. This was a great find for improving calcium level. I’m very pleased with this product. I bought this product for my grandmother who always have problem with her joints. It meets all expectations that she needed. I truly recommend it for its excellent quality. Perfect amount of calcium in each capsule, and with the amount of vitamin D included makes it a very nice feature!! Great product! Whether or not suitable for teenagers? It is safe for teenagers.